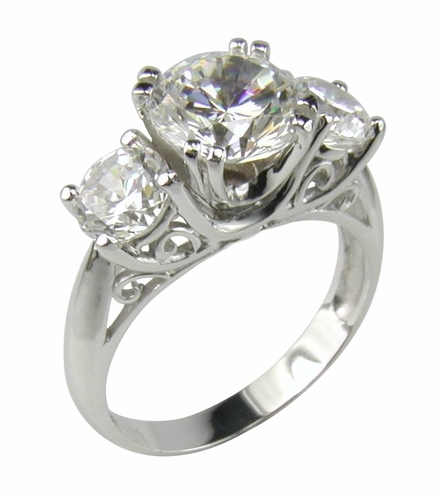 The Camelot Three Stone 2 Carat Round Cubic Zirconia Antique Anniversary Ring has a 2 carat 8mm center cubic zirconia set with double prongs. 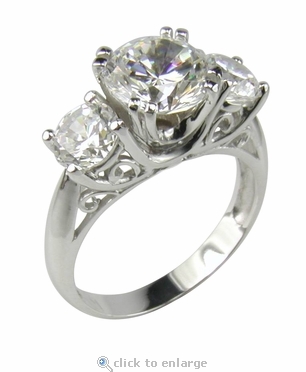 Two additional .50 carat each round cubic zirconia add up to a total carat weight of three carats for the entire antique style anniversary ring. The gallery area beneath the stones has scroll wire work detailing giving you a true designer look with a Victorian and antique styling. Ziamond's round Russian formula cubic zirconia stones have 104 sparkling facets that are hand cut and hand polished making every cubic zirconia stone we offer the best possible quality available in today's marketplace. Due to extremely low pricing, all clearance sales are final. Clearance items may be sized for an additional fee of $35. Sizing below a 5 or above an 8 is subject to additional fees, call for a quote.